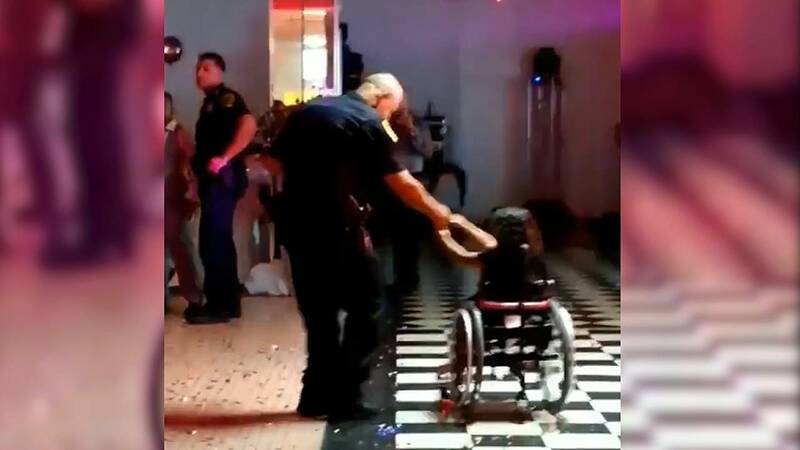 (CNN) - Houston police officer Sandy Fernandez was on duty at a quinceañera over the weekend when a 6-year-old girl in a wheelchair smiled and waved at him. Fernandez couldn't resist the sweet smile, so he reached out and asked her, "quieres bailar?" or "do you want to dance?" "I felt like she knew me, even though I had never seen her before," Fernandez told CNN. "We danced a couple of songs and towards the end she didn't want to let go." Little did he know that the deejay performing at the quinceañera -- a celebration of a girl's 15th birthday -- was recording their every move. The deejay, Juan Mancha, found the moment so touching that he shared the video on Facebook. "So last night I was djaying and this is why I love my job. This cop asked her to dance ... she's so beautiful!," he said in his post. But Fernandez says that he didn't think anything of it. "I had no idea I was being recorded until the end of the dance," he said. "My job is to build a relationship with the community, and that's pretty much what I was doing." The Houston Police Department also shared the video on Facebook, along with the caption, "This is what relational policing is about!" But he won't forget her. "She stole my heart," he told CNN. "She not only reminded me of my sister, who was born with brain damage and is in a wheelchair, but she also reminded me of my 9-year-old daughter. It really touched my heart to see her so happy."